Russia is taking its time before reacting to Donetsk People's Republic’s plea to consider its accession into Russia while calling for dialogue between Kiev and the eastern regions. The Russian president’s spokesman Dmitry Peskov has told Kommersant newspaper Russia does not yet have a response to the plea. On Monday, Donetsk People's Republic proclaimed itself a sovereign state and asked Moscow to consider its accession into Russia, the Republic’s council said. 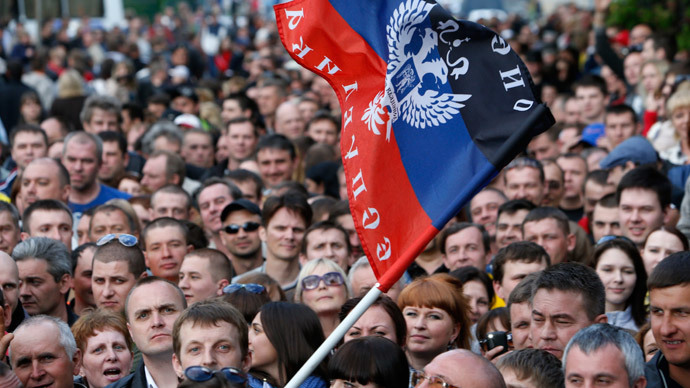 Earlier in the day, the results of referendums were announced in Donetsk and Lugansk Regions, showing the majority of voters support self-rule, amid an intensified military operation by Kiev which resulted in several deaths. Experts on the issue have weighed in with their view on Russia’s response. International legal expert Alexander Mercouris told RT that Moscow’s reaction was consistent with its previous policy on Ukraine. International relations expert and senior lecturer at Moscow State University Mark Sleboda also told to RT that he does not view Moscow’s reaction as contradicting its previous stance. “Moscow’s reaction to the referendum – they of course recommended that it be postponed, and they had a somewhat tepid reaction to it. But at the same time they did not completely disown it either,” Sleboda said. “The first statement out of Moscow this morning that it looked forward to a dialogue between Donetsk, Lugansk and Kiev to resolve the situation and implement the people’s will was a very strong indication that Russia is still really trying for dialogue with Kiev,” Sleboda added. Professor of History and Politics in Berlin Ronald Suni noted that Russia’s slow response will indeed provide room for international dialogue, which may help the situation. “Vladimir Putin and his advisors decided a few days ago that we’ve got to pull back, that we’ve got to slow things down. That all these people acting in their own interest, out of their own emotions and passions could lead to some very dangerous situations - civil war or international war,” Suni told RT. “So, why not postpone the referendum, which of course the locals did not want to do, recognize the May 25 elections, which part of Ukraine probably won’t do, and pull troops back from the frontier, which Putin did. Even so, these actions have not led to a response, on both sides it would allow for some kind of international negotiation,” he added. Mercouris also explained the referendum results are valid statement of opinion. “Yes, they were organized in great haste, in civil war, revolutionary conditions, but even people who are present, who are hostile to these referendums, from the Western media now accept that these are in fact representative of the powerful mass movement,” he said. “And three, we have to remember that this did indeed happen under the barrel of a gun – but not the barrel of the gun of the self-defense forces, but under the barrel of the gun of this Kiev regime who was actually killing voters as they tried to vote against it on the referendum day,” he argued.